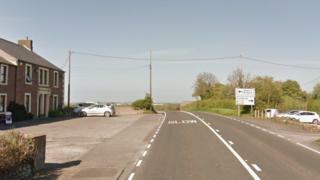 A pedestrian with five children and 15 grandchildren has been killed in a collision between two cars. Wendy Helen Bolson, 79, from Caldbeck, was pronounced dead at the scene of the crash on the A595 at Red Dial near Wigton at about 22:15 BST on Monday. The drivers of the two cars, a VW Golf and BMW 116, were local men in their 20s, Cumbria Police said. Police are appealing for witnesses to the crash near the Sun Inn.